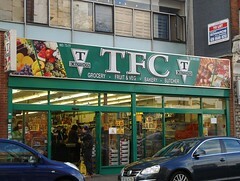 Large Turkish grocery shop and greengrocer (aka TFC) on London Road, part of a chain with branches all over London. As well as fresh vegetables and fruit, they also sell lots of types of tea, things in jars and tins, several types of Turkish bread, and alcohol. It's quite a large shop; not only does it span more than one shopfront, but it also goes back quite a long way. Last edited 2018-12-19 11:04:20 (version 30; diff). List all versions. Page last edited 2018-12-19 11:04:20 (version 30).